The history of urbanisation of Bengal seems to have started since the 1st millennium B.C ; after the decline of Indus valley civilisation. Ancient Bengal was a centre for trade and urban networking, with contacts up to Persia. The archaeological sites like Chandraketugarh, Mahasthangarh and Mainamati, the Bateshwar ruins all are evidence of a highly organised urban set-up. Architectural remains of early Bengal remain scarce, stupa fragments have been found at some archaeological sites. The Pala architecture is remembered for its constructon of viharas and stupas. The Somapura Mahavihara is an iconic monument built by the Palas (now in Bangladesh). The mode of building in rural Bengal is the paddy roofed thatched traditional chala type of huts. Temples have drawn inspiration from this and amazing number of temples have been constructed in different districts of undivided Bengal with many interesting variations. What follows in the rest of this write up is the variety and piety of these structures, many of which are still available for us to see ! Village in a clearing at Sundarbans showing thatched huts, drawing, Frederic Peter Layard, January 1839. In early times wood and bamboo were used as building material. After that bricks were used. The land of Bengal has alluvial soil and stone is not much available. Hence brick is used for building. the architectural parts were made of stone and wood, black basalt, sandstone , granite and black marble. Initially lime or mud was used for the floor concrete. Later mortar was used and lime was used as a plaster. the accounts of travellers Fa-Hien and Hieun Tsang mention temples of stone and brick in ancient Bengal. The Ramcharita of Sandhya Kar mentions Bangarh as an important temple city. But most of these temples have not survived to this day and have destroyed either due to climate or by invaders. The main types of temples in Bengal are many and varied yet a basic similarity is detectable, a beautiful architectural signature ! Firstly the Bhadra type : roof is of horizontal tiers which diminish gradually and are topped with a amalaka sila. The Rekha type has a sukanasa shikhara or tower which is curvilinear and topped by a amalaka sila carrying a kalasa or pot of plenty. A hybrid of these exists which is bhadra with a stupa as acrown. Another variety has a shikhara as a crown. The Sarvatobhadra is a square temple with four entrance points on four sides. Usually five storeys and sixteen corners, spires and turrets are parts of the temple. The hut or chala type of temple have sloping roofs. The ratha type is arranged in tiers of bent cornices, corners with miniature curvilinear towers and topped by a large sized shikhara. The Bhadra type of temples can be studied by the image of Nandi pavillion at Ekateswara at Bankura district, with two receding tiers. the evolution of this type is exemplified at Jangibadi in Dhaka with a amalaka sila crowning the structure. Further on, it can have kalasa as already mentioned, as in Mandoli, Kumarpur. The Rekha deul or temple are slimmer, taller, curvilinear and built on a square platform. with a amalaka sila or kalasa crowning the structure. Gothic architecture has influenced the design of these temples. The hut or chala type of temples has sometimes been called ‘cottage architecture’ of Bengal which resembles the thatched roof. There are many such temples across Bengal. The terracotta temples when classified based on their number of spires or superstructures are a type of chala or ratna respectively. The single hut are the ek-chalas, the double huts type are called the do-chalas. The others include triple huts, the teen-chalas, twin huts the Jor-mandirs or temples, the twin double hut type and the grouped hut type. Twin hut type or Jor-Bangla are temples where two do-chala hut type temples are joined. The twin temples of Bimanagar, Nadia and Bishnupur, Bankura are of this type and decorated with ornate carvings. The hut type also influenced the Sultanate architecture of Bengal. Jor-Bangla Temple, Bishnupur, Bankura,West Bengal. The Rasamancha at Bishnupur is different and does not conform to the styles mentioned. It has a circumbulatory passage on all sides. It has a square chamber with arched openings and has a pyramidal roof. It stands on a five-foot high platform. The innermost gallery has 5 arched openings on each side, the 2nd has eight and the last has four arched openings. The outer arches have four do-chala roofs with one smaller four chala at the corners for decoration. The temples across Bengal are mostly on platforms up to 6 feet in height. The main temple has a sanctum, with a covered verandah in front mostly with three arches with pillars. On top of the temple there are spires. The Kalighat temple at Kolkata is a char-chala or having four sloping roofs. The Ratha typre of temple is exemplified by the temple at Kantanagar (presently at Bangladesh) at Dinajpur. The ratha type combines the hut and shikhara design. These temples stood on platforms with bent cornices and three arched openings on each side. A long spire is in the centre surrounded by 4,8,12,16 or 24 spires. The Hangeswari temple at Hooghly is a 13 spired ratha temple, south facing having 12 arches with ornate terracotta design. 25 spired ratna temples or panchabhimsati ratna are seen at Krishna Chandra temple at Kalna, Bardhaman. The Ananda Bhairabi temple at Sukharia, Hooghly built in 1813 has three storeys and 25 towers. At some places separate rathas were made. One example is at the Radha Gobindo temple at Bishnupur in Bankura district. Ek-ratna, the Madan-Mohan Temple of Bishnupur, Bankura, West Bengal. Palpara temple in Nadia is a char-chala,one of the earliest forms of temple architecture in Bengal , built in the 17th century by Gandharba Roy, also called Math mandir and Kali Mandir. The char chala structure stands on a raised plinth and is made of brick facing south . and is around 21 metres tall. The decorated arched entrance is flanked by brick pillars on either side. The area above the arched entrance once contained intricately carved terracotta panels. Some scenes from the Ramayana, geometric and floral patterns and the lotus motif still remain. Later the char-chala was modified into the at-chala, which consists of a char-chala upon a char-chala, and is a most common type of temple architecture in Bengal. Char-chala, Palpara Temple, Nadia,West Bengal. Pancha ratna, Shyam Rai Temple, Bankura,West Bengal. The temples of Bengal and their exquisite architecture has influenced the temples of Burma, Siam, Cambodia, Java and Nepal. The sculpture at the temple vide the terracotta art was the art of the common people. 17th century onward to the 18th century was a period of expression both for the artists, craft-persons and the patrons alike. The patrons were the rulers, landlords and wealthy merchants. There was a lot of temple building at Bardhaman, Birbhum, Bankura, Nadia, Hooghly and Murshidabad. The depictions on the temples are condensed and full of vitality. There are panels of processions, soldiers, horsemen,elephants with their riders, deities, geometrical motifs, floral motifs, miniature temple are shown above the other. Scenes from the epics, social scenes,, Europeans, love scenes too can be seen at different places. The 19th century saw some flat roofed temples being built. Temple building of this type went on up to the middle of the 19th century. It declined under Western influence. At-chalas, 26 Siva Temples in Khardah beside Ganga, Barrackpore,West Bengal. At-chala, Bhukailash Shiv Temple, Khidirpur, Kolkata. Nava-ratna, the Dakshineswar Temple, Near Kolkata,West Bengal. Ek-ratna, Lalji Temple in the city of Bishnupur, West Bengal. Ek ratna, Ananta Basudeba Temple, Hooghly, West Bengal. By Amartyabag (Own work) [CC BY-SA 3.0 (https://creativecommons.org/licenses/by-sa/3.0)%5D, via Wikimedia Commons. Panchavimsati Ratna, Lalji Temple,, Kalna,Bardhaman,West Bengal. The word deul is actually a nomenclature given to a temple style of Orissa, North India and Deccan between 6th and 10th centuries. The temples of Bengal are termed as the Rekha deul, having a square sanctum, curvilinear shikhara or tower, vertical ridges or projections on the walls. Rekha deul, Pratapeswar Temple, Kalna, Bardhaman, West Bengal. Rekha deul, temple of Ichai Ghosh, Bardhaman,west Bengal. Rekha deul, Banda, Purulia,West Bengal. By Amitabha Gupta (Own work) [CC BY-SA 4.0 (https://creativecommons.org/licenses/by-sa/4.0)%5D, via Wikimedia Commons. Rekha deul, Mothurar Deul, Faridpur (in Bangladesh). Terracotta art of Bengal/Biswas,S.S,Delhi : Agam Kala Prakashan,1981. Indian terracotta art/Ganguly,O.C, Bombay : Rupa and Co,1959. This entry was posted in art history of India, asian art, Bengal art, Bengal temple architecture, sculpture of india, Temple architecture, Temples of India, Terracotta, Terracotta temples and tagged art history, art history of Bengal, art history of India, Bengal, sculpture, Temples, temples of Bengal on November 15, 2017 by historyreads. The terracotta temples of late medieval Bengal have many themes depicted on its walls, facades and pillars. There are scenes from everyday life too. There are processions of warriors, rows of elephants, zamindars and nobles on palanquins. Among the splendid images one can find ornate boats and ships. What do these boats represent ? Obviously they are going somewhere and carrying some people across. The two types depicted are river boats and sailing ships as has been studied and reported after arduous researches by scholars. Terracotta work on Jor Bangla temple, Bishnupur. Lalji Temple, Kalna,Bardhaman temple, West Bengal. The topography of Bengal and the rivers Ganga and Brahmaputra traverse the region with many tributaries and branches, Thus a transport system emerged using different boats for navigation on the rivers and its canals. These boats then got captured on terracotta depictions by the craftsmen or karigars. The boats have many interesting features. Some passenger boats have the prow with the structure of the head of the crocodile,elephant and peacock. Some boats have dragon-heads. The boats are seen steered with quarter oars. The ship depictions were not as authentic as the boats, it was only to give an impression. The sailors were projected wearing hats and armed with muskets like the European as seen by the Indians of that time. Terracotta Panel, Ananta-Basudev temple, Bansberia Royal Estate, Hooghly, West Bengal. Bengal temples/Dutta, Bimal Kumar , New Delhi : Mushiram Manoharlal,1975. Boats and Ships in Bengal Terracotta Arts, Jean Deloche, Bulletin de l’Ecole française d’Extrême-Orient Année 1991 Volume 78 Numéro 1 . This entry was posted in art history of India, asian art, Bengal art, Boats and ships, sculpture of india, Temples of India, Terracotta, Terracotta temples and tagged art history of Bengal, Bengal, boats, sculpture, Ships, ships in art on October 28, 2017 by historyreads. Jewellery has always occupied an important place in the social and cultural life of India. Initially men and women used natural material for beautification of the body like leaves and flowers followed by beads using other type of material. In course of time, metals like gold was used to make ornaments which continues to this day. The figure of the bronze dancing girl found at Mohenjodaro, one of the Indus valley sites depicts her wearing necklaces and a number of bangles. Gold, silver and ivory, copper, bone, shell and terracotta have all been used to make ornaments. Excavations at Harappa and Mohenjodaro yielded variety of beads which were strung together and worn as armlets, bracelets, necklaces and girdles. Vedic texts make enough references to jewellery and its use to decorate the body. The Ramayana and Mahabharata, India’s great epics describe jewellery elaborately. When Sita daughter of King Janaka gets married to Lord Rama, she is bedecked with ear ornaments, nose ornament, chandrahaar , bracelets, anklets with bells etc. her head ornament the chudamani is believed to have been given to her father by Kubera, the God of wealth himself. Lord Rama wears pearls on his crown, and as ear-rings and around his neck. Yudhistira loses a rare pearl during his gambling game with the Kauravas in the Mahabharata. Buddhist and Jaina literature mention ornaments. The Jataka tales mention jewellery including those worn by elephants and horses. The Kalpasutras, Jaina texts describe different ornaments. In ancient India, following the Indus valley times and the Vedic era, the ascendancy of the Mauryan dynasty unified the Indian subcontinent. Trade routes opened and rare and new gems came to India. The Arthshastra written in 3rd century B.C by Kautilya describes jewellery types. Jewellery was worn both by men and women. The yakshi from Didargunj, Patna wears a headband, a pendant, girdle on her waist and anklets. Terracotta figures from this age also depict jewellery. Bharhut, Sanchi, Bodhgaya and Amaravati are attributed to the Sunga and Satavahana phase of Indian history. Their art reveals a variety of ornaments used on head,ears,neck,arms,waist and feet. Motifs were drawn from nature or religion. Short necklaces were called Kanthi and in case it had a large pearl as a centre-piece it was called sirshak. A necklace having alternate gold and pearl beads was called Apavartika. Ratnavali was a necklace having many gems, pearls and gold beads. Shankhavalayaswere made of conch, ratnavalayas set with precious stones, jalavalayas were bracelets with perforations. Mekhala,Kanchi,rasana and sarasana were different type of girdles. Various names have been assigned to anklets such as manjira tulakoti, nupura, padangada,hamsaka and palipada and kinkini for the ones with bells. Trade was prevalent between South India and Rome at the beginning of Christian era and the gold which came in was converted into jewellery. Jewellery of Satavahanas is described inGathasaptasati written in Prakrit by a ruler. A circular jewel was placed in the centre of the usnisha(turban), kirita(a crown with jewels) was worn too. Women wore the chudamani and the makarika(crocodile shaped jewel) was also very popular. Ear kundalas were in vogue. The phalakahara consisting of gold slabs as very popular among necklaces. The jewellery of Taxila and adjoining townships of Sirkap and Sirsukh have revealed a blend of Indian, Greek, Persian and Greco-Roman in design and form. This is because the city was built and destroyed many times between 500 BC to 500 A.D. by invaders like the Greeks, Mauryas of Magadha, the Bactrian Greeks, the Sakas, the Parthians, the Kushanas and the Huns. The Sungas replaced the Mauryan dynasty. Bharhut sculptures are seen wearing a variety of ornaments. Ear-rings were termed Karnika or kundala if they were ring shaped. A single string of beads was called ekavali. Armlets were very much in use. Bracelets were also worn, girdles were worn by women. Hair ornaments kept hair in place. Sakas, Parthian and later the Kushanas followed the Sunga rule. This had an impact on the society of ancient India as they came from Central Asia and influenced indigenous art and craft of India. Fertility deity. Sunga dynasty, Chandraketugarh. Kanishka, a Kushana ruler patronised art and his rule was from Bactria to Magadha and Kashmir to Saurastra. Gandhara was an important centre with Roman influence and the other was Mathura which was purely Indian. Jewellery has been excavated from Taxila which include gold, copper, bronze pendants, bracelets, bangles and armlets. Kushan jewellery is evident in the Gandhara and Mathura sculptures. The railing pillars at Mathura depict Yakshi with nupura(anklets), mekhala(girdles), hara(necklace), valaya(bracelets), bangles, ear-rings and finger-rings. The excavations at Chandraketugarh in West Bengal of the Sunga era too have revealed many fertility goddesses, mother and child figures etc. The figures have adorned bodies with elaborate coiffure and jewellery. Head dress and fashion of hair dressing is evident form figures found at Pandu Rajar Dhibi in west Bengal. They are seen wearing a conical helmet like hairdo; and also a fan shaped one! The mauryan hairstyles depict neatly combed hair and hairdos with bi-cornate arrangement. Decorative hairpins are seen on Sunga-Kushana figures. along with jewelled bands. used to tie the braid. These head ornaments are though to be the prototype of the kiritamakuta. Forehead ornaments like tikli can be seen on women. The tikli can be seen having radiating beaded strings. Kundalas or ear ornaments were worn by both men and women. Over-sized ear studs with floral motifs have been depicted too. The neckpieces are a study in itself. Women wore neck collars like the hasuli or a choker. The necklaces are the haras. Long beaded necklaces are seen on the figures, some reaching the navel. The valayas or bracelets were worn by both men and women. They were heavy and the keyura or armlet also used to be worn. Girdles were worn at the waist either single or of more than one string made up of discs spaced by beads. Sunga masculine figure, Sunga 2nd-1st century B.C, Chandraketugarh, Musée Guimet,Paris. Mother and child, Sunga dynasty, Chandraketugarh, West Bengal. Yaksha and yakshis, who were semi -divine beings and resemble human figures, were associated with emblems,animals, birds and mounts. The Yakshis which have been discovered at the archaeological sites of Mauryan and Sunga period outnumber the yakshas (male). Seen with hairpins, these yakshis were common both in Bengal and North India. They are seen wearing ear kundalas, sirastraka, necklace and heavy bangles. Plaque of a Yakshi (female nature spirit), India, Bengal, 3rd-2nd century B.C, terracotta, Honolulu Academy of Arts, U.S.A. The late medieval temples of Bengal have many figures of both men and women, flora and animals. the jewellery is noteworthy. The animals like the horses and elephants are seen wearing jewellery too ! Adornment seems to have been away of life. The Bankura horse also wears jewellery like the Chandmala on its forehead. Jor Bangla temple, Bishnupur,Bankura,West Bengal. M.L.Nigam/Indian jewellery;New Delhi : Roli Books, 1999. Jamila Brijbhushan/Masterpieces of Indian jewellery; Bombay : D. B Taraporewala and Sons,1983. This entry was posted in Ancient Indian history, art history of India, Bengal art, jewellery, sculpture of india, Terracotta, Terracotta temples and tagged art history of Bengal, Art of Bengal, Bengal, jewellery on October 21, 2017 by historyreads. The music of India is highly developed and a sophisticated product of an ancient culture. Lord Shiva’s mystic dance symbolises the rhythmic motion in the universe. Music is sound in rhythm. Goddess Saraswati is represented as the goddess of art and learning and is seen sitting on a white lotus with a veena in one hand and playing it with another, a book in the third hand and a necklace of pearls in the fourth hand. Sage Bharata is believed to have taught the arts to apsaras, the heavenly dancers. Narada muni who wanders both on earth and heaven playing his veena taught the art to men. In Indra’s heaven, Gandharvas are the singers , apsaras are the dancers, and the centaur-like beings the Kinnaras play musical instruments. Gandharva veda means the art of music. A very wide variety of musical instruments were used in Vedic times, both percussion and stringed. The ordinary drum was the dundhubi. Adambara, bhumi dundhubi were others. Aghati was a cymbal which accompanied dancing. The kandaveena was a kind of lute, karkari, another kind of lute, vana , a lute of 100 strings and the veena. The veena is suitable to all types of Indian music. Indian stringed instruments include the veena, an instrument which consists of a large bowl, hollowed out of one piece of wood. The flat top of this bowl is one foot in diameter. A bridge is placed on the bowl and near it are anumber of small sound holes. The veena is played using finger nails or using a plectrum. Sitar, dilruba,esraj,ektara are other stringed instruments. Sarangi, surbahar are also stringed instruments. Kinnari is a primitive Indian instrument supposed to have been invented by Kinnara , one of the musicians in Indra’s heaven. It has representation in sculpture and paintings. It has 2-3 strings, sound is not very strong. Sculptures of many musical instruments exist on old cave temples and Buddhist stupas. Amaravati and Sanchi depict many such sculptures. Music and dance have been depicted in the terracotta sculptures in the late medieval temples of Bengal as well. Showcased below are two temples; the Madan-mohana temple at Bishnupur and the Hangseswari temple complex at Hooghly, both in West Bengal. The Madana-mohana temple built by Maharaja Durjana Singh Deva is a ekratna, having a single spire on a plinth with a portico in the centre. It is dedicated to Lord Krishna as the name suggests. There are two magnificent pillars at the entrance with ornate terracotta sculptures. The pillars depict scenes from the Ramayana and scenes from Lord Krishna’s life from his cowherd days. One can find musician and dancer depictions here. The dancers are in different poses and the musicians are seen playing instruments. Floral designs are seen between the human sculptures as rows adding a sense of balance.The scenes are full of vitality, joy and convey a celebration of life ! Musicians and dancers, Madana-mohana Temple, Bishnupur, Bankura,West Bengal. The Hangseswari temple at Hooghly has a very interesting history and architecture. The area of Bansberia next to the River Ganges, in Hooghly district was gifted to a zamindar Rameshwar Ray by Mughal Emperor Aurangzeb along with the title of Raja in 1673. He settled down there along with his family. His kin continued to stay there. The area came to be known as the Royal Estate. The temple was started to be built by Raja Nrisinhadeb Ray from late 18th century and completed by his wife Rani Shankari in 1814 and dedicated to a form of Goddess Kali, Hangseswari. The deities of both Shiva and Shakti are present. The temple has thirteen spires and five stories which represent the ida, pingala, Bajraksha, Sushumna and chitrini of the human body parts according to Tantric texts. The king had studied the system of kundalini during his stay at Varanasi and decided to build a temple according to the concept. Marble was brought from Chunar near Varanasi for use in the temple. The spires represent blooming lotus buds; a metallic idol of the Sun-God is inscribed on the top of the central spire. The inner structure of the building follow the design of the human anatomy. The temple complex also has the Ananta-Basudeba temple and the Swanbhaba Kali temple, built by Raja Nrisinhadeb Ray in 1788. Both are terracotta temples and have exquisite sculptures on them. Hangseswari temple, Hooghly, West Bengal. Dancers, Rasmancha, Hangseshwari temple, Hooghly,West Bengal. Ananta-Basudeb temple, Hooghly, West Bengal. Carvings, Ananta-Basudeb temple, Hooghly, West Bengal. Terracotta Panel, Ananta-Basudeb temple, Hooghly, West Bengal. This entry was posted in art history of India, asian art, Bankura, Bengal art, Bishnupur, Dance, musical instruments, Temples of India, Terracotta, Terracotta temples and tagged Bengal, Bishnupur, Dance, hooghly, Music, sculpture, temples of Bengal, Temples of India, Terracotta, Terracotta art on October 20, 2017 by historyreads. 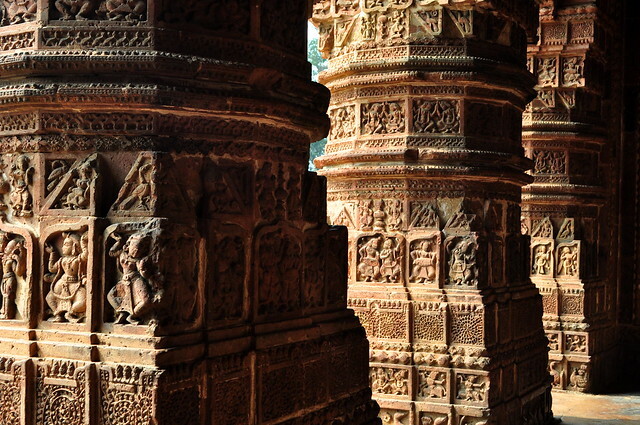 The temples of Bengal (undivided) are well known for the intricate terracotta work and carvings. The themes depicted are many. Among them the Hindu epics Ramayana and Mahabharata are also seen at many places. Scenes and characters from the epics are sculpted. Showcased below is a a terracotta creation from a temple at Surul, a village in Birbhum, West Bengal adjacent to Visva-Bharati University, founded by Rabindranath Tagore. Depicted below are scenes from the epic Ramayana. The battle between Lord Rama and Ravana at Lanka has been sculpted above the arch. Terracotta carving of Ramayana, Surul , Birbhum, West Bengal. The Ramayana was composed by Sage Valmiki (5th century B.C to 1st century B.C , ie. more than 2500 years ago. It is the story of Lord Rama, an avatar of Lord Vishnu of Hinduism. It has over 24,000 verses spanning 5 chapters and is the longest epic poem of Hinduism. Rama is the prince of Ayodhya , eldest son of King Dasaratha. Rama is to succeed him but King Dasaratha’s second wife Kaikeyi wants her son Bharata to be on the throne. She schemes against Rama and sends him along with his wife Sita into exile for 14 years. During this time Sita is kidnapped by demon king Ravana of Lanka. However with the help of his brother Lakhsmana , who accompanies him on his exile and the monkey general Hanuman, an ardent devotee of Lord Rama, Sita is rescued after a fierce battle. After the exile they come back to Ayodhya and Lord Rama is crowned king. They have two sons Lava and Kusha. However Sita is accused of being unfaithful and asked to prove her chastity. She prays to Mother Earth and vanishes for ever but is immortalised; as per the epic. Ramayana is very popular and Rama and Sita are thought of as ideals and their victory is taken as the victory of good over evil. There are many sub-stories which teach valuable moral lessons. The great epic has been depicted in art since ancient times. There are miniature paintings, sculpture, modern paintings, translations in many languages, versions in other Asian countries, songs, films and television serials about the epic, given its timelessness and popularity. Thus the terracotta temples in Bengal (undivided) are no exception and could not escape the magic of this epic story. Sage Valmiki, painting, unknown artist. Scene of the battle at Lanka between Rama with his forces and Ravana, print, British Library, London. The Kanta Nagar temple at Dinajpur in Bangladesh was built by Maharaja Pran Nath, started in 1704 and completed by his son Maharaja Ramnath by 1722. It is a magnificent edifice with fine terracotta carvings. The epics are depicted on the temple, some characters can be seen on the pillars too ! Detailing of terracotta, Kantanagar temple,Bangladesh. Terracotta, Kantajiu temple, Kantanagar, Bangladesh. The Radhabinod temple at Jayadev Kenduli, a village in Birbhum district of West Bengal depicts scenes from the epic Ramayana. It is a navaratna temple, one having nine spires. Jaydev Kenduli was believed to be the birthplace of Jayadeva, the composer of Gita-Govinda from the 12th century, a classic Sanskrit work on Radha-Krishna and the gopis of Vrindavan. The gopis were the other cowherd girls who loved Lord Krishna. The land of Birbhum has been known as the land of red mud. The Radhabinod temple was built by Maharaja Kirtichand of Bardhaman in the 17th century. The Ramayana scenes at the temple depicts the battle between the demons and the monkey army or vanar-sena. Radhabinod Temple at Jaydev Kenduli, Birbhum,West Bengal. Ramayana scene at Radhabinod temple, Jaydev Kenduli, Birbhum, West Bengal. This entry was posted in art history of India, Battlescenes, Bengal art, sculpture of india, Terracotta, Terracotta temples and tagged Art of Bengal, sculpture, Temples, Terracotta art on October 20, 2017 by historyreads. Man is as much a part of the earth as is the nature around him. The best of nature exists as rocks, trees and animals. Some animals have played a big role in man’s life. He has captured them in art in sculpture,painting and even on coins as symbolic depictions. Fauna is a term used to represent animals in general. Various representations of fauna can be seen in different works of art, mythological story depictions and rock shelters from prehistoric times. Mughal emperors have left behind hundreds of animal and bird depictions in miniature paintings for posterity. The terracotta temples of Bengal have many animal depictions shown in interaction with humans in different capacities. Showcased are some fauna images from the temples. The animals include horses, oxen, elephants and tigers in combat too ! Dogs are seen on some illustrative panels along with the overall scene or procession depiction. 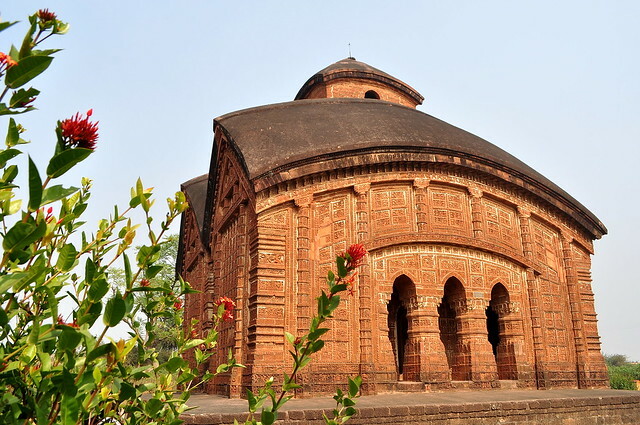 The Jor-Bangla temple at Bishnupur, was built in 1655 A.D by King Raghunath Singha Dev. It is richly ornamented with terracotta carvings. The roof has the classic chala style of Bengal architecture. The carvings show animals in the panels and borders. Jor Bangla temple, Bishnupur, Bankura,West Bengal. Terracotta work on Jor Bangla temple, Bishnupur, Bankura,West Bengal. The Shyamrai temple also at Bishnupur is an architectural gem classified as a pancharatna built by King Raghunath Singha in 1643. It is a brick temple, massive in scale and has superb ornamentation. The temple stands on a square plinth with a char-chala roof surmounted by ratnas at each corner. The chala type of construction has been derived from the thatched bamboo framework roof design of huts of rural Bengal. The figurines at the temple are advanced and portray scenes from the epics. Depicted below is ratha or chariot in terracotta wherein horses can be seen. The main figure is surrounded by a geometric and floral motif. Terracotta work on Shyamrai Temple Bishnupur, Bankura,West Bengal. Kantanagar at Dinajpur, Bangladesh (previously part of undivided Bengal) is home to the Kantajiu temple from the 18th century. Kanta refers to Lord Krishna. Started by Maharaja Pran nath in 1704, this 50 feet high three storeyed brick temple rests on a platform and was completed by Raja Ram Nath in 1722 A.D. Originally the temple had nine spires but an earthquake destroyed them in 1897. Thus it was a navaratna. The terracotta work at outer walls of the temple with scenes from the epics,floara, fauna and geometrical motifs. Animals like horses and elephants are part of the portraiture. They can be seen with riders on them as part of the overall depiction and are wearing jewellery and bells. The detailing is very clear and reflects the superior craftsmanship of the terracotta artists. The Lalji temple at Kalna, Bardhaman is a panchabhinsati ratna because of the 25 spires on its roof. It has exquisite terracotta panels on its outer walls and is built of brick like so many other temples of Bengal. This temple was built in 1739 and has char-chala mandap in front. The temple also has some beautiful terracotta panels. The terracotta panels show lions and elephants in combat, horses drawing chariots or carrying their riders who are in combat ! Dogs are also depicted. Lalji Temple, Kalna, Bardhaman, West Bengal. Terracotta panel, Lalji Temple, Kalna, Bardhaman, West Bengal. Animal depictions at other temples like Gopalji temple,Kalna and Rameswar temple,Kalna depict oxen pulling carts, horses with riders, tigers and elephants in combat mode. The figures convey a sense of movement and energy and refelct the innate skill of the craftsman of that time. Terracotta is used to this day to carve and sculpt animals which are iconic craft items in status and are loved by people. The terracotta horse is used as a symbolic sacrifice for fulfillment of wishes to appease the village God Dharmathakur in Bankura district of Bengal. Terracotta panel, Gopalji Temple, Kalna, Bardhaman, West Bengal. Rameswar Temple, Kalna, Bardhaman, West Bengal. This entry was posted in art history of India, Bengal art, Temples of India, Terracotta, Terracotta temples and tagged animals, art history of India, Art of Bengal, Bengal, sculpture, Terracotta, Terracotta art on October 12, 2017 by historyreads. Many themes are portrayed in the terracotta plaques, or on the walls and facades of the temples of Bengal. The images of Radha-Krishna dominate many of the temples. The images are in monochrome format but manage to convey the much-loved presence of Lord Krishna with his flute, along with Radha or the other gopis. Such is the skill of the artist- craftsman or karigar. This technique has been perfected in a region where instead of granite or sandstone, clay and laterite were available and used for building and sculpting on the walls of the temples. The geological profile of Bengal is that of a fertile alluvial soil and laterite tracts in many districts covering Bankura, Bardhaman, Birbhum, Midnapur and Malda. Laterite has also been used during construction of Bengal temples. Episodes from the epics, the Puranas and everyday life including erotica has been depicted in some temples. Showcased are some Radha-Krishna images in terracotta which are both exquisite in detail and awe-inspiring. The Ras-chakra depicts the Ras-lila. Raslila is a celebratory dance done in the form of a ras-mandala or ras-chakra by gopis along with Lord Krishna Gopis are cowherd maidens who are smitten with Lord Krishna, Radha being the main among them.The Raslilais described in the Bhagavata-purana and Jayadeva’s Gita -Govinda. The word lila means play or act, whereas ras refers to emotion or essenceflavour/mood etc. It is difficult to find an exact synonym in the English language; raslila is a dance of divine love. It is believed that one night, on hearing Krishna playing on his flute, all gopis of Vrindavan left their homes and joined him in a dance in the forest or grove where they danced through the night. Lord Krishna manifested himself in multiple form and each gopi believed that he was dancing with her. A unique circle is formed in the raslila called the ras-mandala. The Bhakti tradition followers believe that the earthly romantic love between human beings is a dilute form and the intense love for Krishna felt by the gopis is like the soul searching for the ultimate , the God divine in the spiritual realm. The gopis are believed to be shadows of Lord Krishna’s own form. A splendorous Ras–lila depiction is seen at Shyamrai Temple at Bishnupur in Bankura district. Ornate floral medallions are seen around the depiction. Ras-lila depiction, terracotta work on Shyamrai Temple, Bishnupur,West Bengal. The Ras-lila is a popular theme and has been depicted in the media of paintings too. Below is shown a Ras-lila depiction in painting from the Jaipur school from the 19th century. Radha-Krishna and gopis in Ras-lila, Jaipur, 19th century. The Brindaban Chandra’s Math at Kalna has Radha-Krishna sulptures in terracotta with ornate floral patterns around the main figure to give an impression of symmetry. After the floral pattern, one can see medallions in different shapes to add to the overall effect. Brindaban Chandra’s math, Ambika-Kalna, Bardhaman, West Bengal. Radha-Krisha sculptures, Brindaban Chandra’s math, Ambika-Kalna, Bardhaman, West Bengal. The Brindaban Chandra Math from Guptipara, Hooghly has a complex of temples made from brick of the 18th and 19th century. Temple Complex, Brindaban Chandra’s Math,Guptipara, Hooghly, West Bengal. A Radha-Krishna depiction with floral decoration around can be seen below. Radha seems to be lost in the soulful music being played by Lord Krishna on his divine flute. Brindaban Chandra’s Math, Guptipara, Hooghly, West Bengal. Panel, Lalji temple, Kalna, Bardhaman, West Bengal. This entry was posted in art history of India, Bengal art, Radha-Krishna, Raslila, Temples of India, Terracotta, Terracotta temples and tagged art history of India, Art of Bengal, Bengal, Radha-Krishna, sculpture on October 9, 2017 by historyreads.